When I say “big box home improvement store”, the two most common things that people think of are: price & selection. It can be extremely handy to be able to get your paint, flooring, lights & other odds and ends all in one stop & at a reasonable price. But, what happens when you are shopping for just one thing? That special purchase that is just one department of many in a mega store? When it comes to paint, you start to realize that the price & selection aren’t all that they are cracked up to be. When it comes to price, I won’t lie: some big boxes can send you out with a gallon of paint at a ridiculously low price. However, that same gallon will be of ridiculously low value. You get what you pay for. That holds as true today as it did fifty years ago. Now, what if I tell you that I can send you out of my store with a respectable quality of eggshell latex paint for under $40? That I can sell you my absolute best interior paints in the store for under $65? Suddenly, you realize that not only is my independent store priced competitively but in some instances, Standard Paint & Wallpaper offers a better price on super premium quality paints than those big boxes. We offer products from two paint companies (Sico Paints & Pittsburgh Paints) with multiple interior & exterior paint lines in each brand. What this means is that we can offer value based options right through to the best, super premium products. This like having 5 full interior paint lines along with specialty products like kitchen & bath paints, furniture & cabinet paints and floor paints. Due to the individual attention to customer service that we provide, we can meet the ideal paint product to your needs and not just sell you what is on promotion by our corporation at that time. Another issue with price at the big box store is price inflexibility. Sure, they will price match on the exact same product but what they do not tell you is that their paint lines are exclusively proprietarily owned by them. What that means is that there is no one else who carries that product to compete with them price wise. So, you are buying 6 gallons of paint at $59.99 each, you will be paying $59.99/ gallon for each of the six gallons. So, how does that relate to me? Well, I control my pricing and frankly, I want to develop a relationship with you. I won’t be buying you flowers or chocolates and my singing voice is terrible so I will do us both a favour & skip the serenading of you. What I will do is offer you a discount for buying in bulk or be able to offer you a discount on the painting tools or throw in a freebie promotional item that I have lying around the store. I do this because we are all people & I want my customers to know they are valued and not just 6 gallons of paint at $59.99 each. Selection. Have you looked at the selection in paint brushes & rollers at a big box store? Despite their store being 25X larger than mine, their actual wall space for paint brushes & rollers is quite small. Their selection is usually limited to one or two companies that they have cozy relationships with. I offer a variety of brushes & rollers from multiple suppliers, some of which are not available in the big boxes. I also have the ability to special order other brands that do not appear normally appear in my store to meet the demands of custom orders. When you shop with us, we offer a variety of brushes & rollers that cannot be matched by the big boxes. While we are talking about brushes & rollers, I have a secret to share: I carry some of the same brushes & rollers that the big boxes do. Do you want to know the difference between what I sell & what they sell? MY PRICES ARE CHEAPER!!! Without the massive overhead expenses associated with a 65 000 square foot building, national marketing plans or shareholders looking to receive healthy dividends every quarter, we are able to offer lower prices than the big boxes on the exact same product. We are in business to make money but we do not need to wring each & every penny out of a paint brush. So, we sell it at a fair price and we hope that both you, the customer, and us, the paint store are happy. 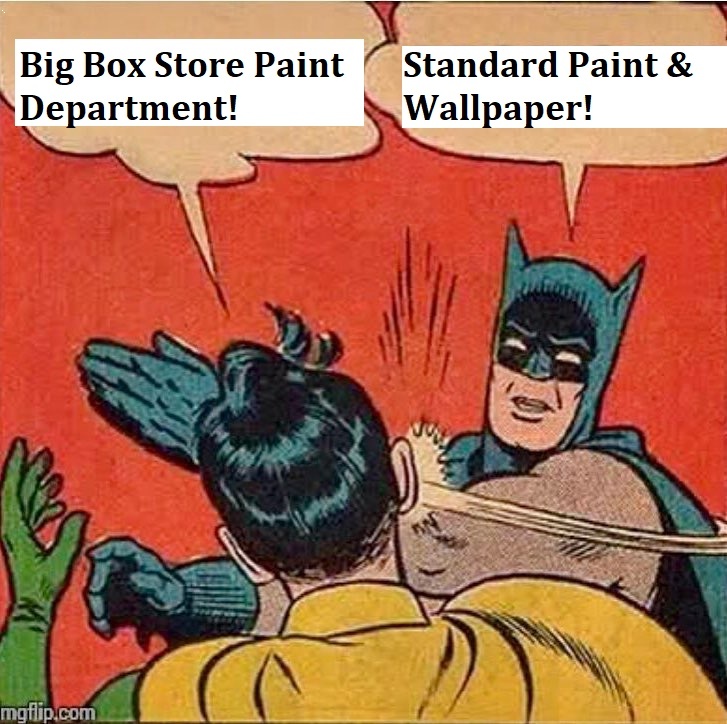 So, now that I have shown that the price & selection myth of the big box is about as real as unicorns & mermaids, how do you feel about shopping at Standard Paint & Wallpaper? I can say with all confidence that once you begin shopping with us for all of your paint & wallpaper, you will never leave.